Leading Aircraftsman Nils William Isaksen 132734. Enlisted in the Royal Australian Airforce 6 Apr 1943 and was discharged 6 Jun 1946. 1939-45 Star, 1939-45 Pacific Star, Australian Service Medal 1939 - 1945,War Medal 1945 and the Return from Active Service Badge. Nils Died in a boating accident. He had just purchased a boat in the Port Hacking River in the south of Sydney and decided to sail it around to Botany Bay and then up the Georges River to his home. The seas were rough and he was warned that it was dangerous but decided to go anyway. It appears that his boat was Blown onto the Jibbon Bombora which is off shore near Bundeena at the head of the Port Hacking River. Wreckage of his boat was found ashore but no sign of his body was ever found. Nils William Isaksen is the first born child of Nils Morgan Isaksen and Rita Martha Bottcher. He was born on 2 December 1924 in Newtown, New South Wales, Australia. From an early age he was an adventurer and showed no fear. In his early years they moved to Sans Sousi and at the age of 7 he sail alone,out on Botany Bay. On one occasion he got into trouble and received a belting for building a make shift boat out of galvanized iron and cement and with the help o9f his friends took it down to the Bay. For recreation he sailed on Botany Bay and occasionally performed in Fencing Tournaments and displays, in which he made some of his own equipment. There was an article in the Women's Day, pages 6 & 7, dated 4 July 1949, where his name, is mentioned. On the 6 April 1943, at the age of 18, Nils enlisted in the Royal Australian Airforce and went to Townsville for training. He was 5'11" tall, medium complexion with brown eyes. On his Service record, it shows his other special qualifications were "Fire fighting, Ju Jitzu and French". 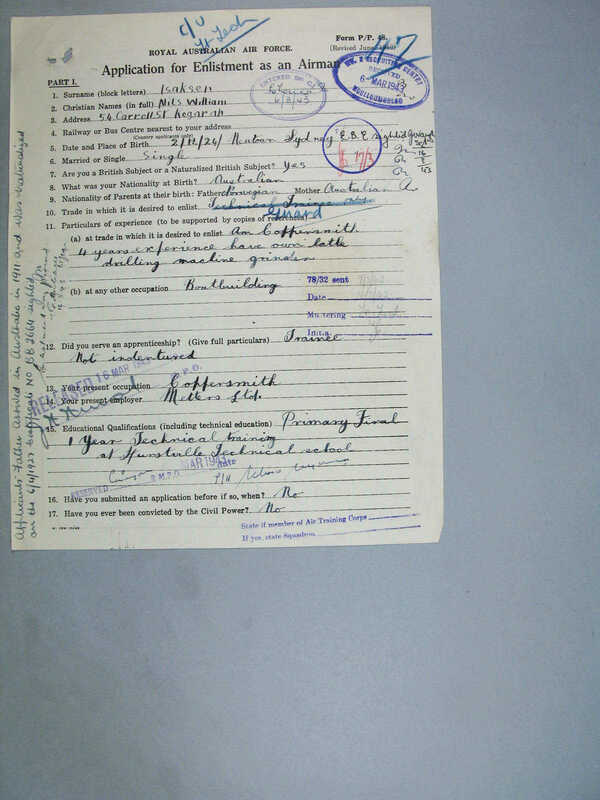 He states his occupation as boat building with his father and livng near Botany Bay, in his hear he would like to have joined the Navy, but apparently "there were more men than ships". At the time of his enlistment he lived at 54 Carroll St Kogarah whith his parents. He went through a special training Unit and a selection process to find what he was best suited for. He joined the 549 Squadron, that was attached to the British RAF. Nils had a few months with this unit and upon additional training was transferred to 26th Repair and Servicing Unit and served in the Pacific region, at Noemfoor, one of the Biak Islands in Papua Province. During the war against the Japanese, at various times both the Japanese and the allied Forces operated major air bases from this site. In April 1945 he was transferred to Morotai where he served for approx five months. From Jan 1946 he was transferred to 200 Flight. 200 Flight was a top secret unit involved in the final year of WWW. Due to the secrecy of the tasks, personnel were forbidden to speak about their duties. This was a specialist flight who flew in Dakota Aircraft (which were the work horses of the Air Force) that had been equipped with the then State of the Art Radio Detection equipment. They were used during the Borneo Campaign in 1945 to locate Japanese communication centres. The RAAF 200 Flight was equipped with six heavily modified Liberator aircraft. It was tasked with the insertion & supply of intelligence gathering parties behind Japanese Lines in Borneo and Timor, and at the time dropping supplies and ammunition in order to assist these and other operatives. The Liberators achievements were remarkable, considering the size of the unit and the period in which they were operational. The Unit had three aircraft shot down. In February, 1946 Nils was transferred to 21st Squadron. This squadron re-equipped with Liberators, converted to heavy bomber role and saw action as a fighter & Dive bomber. They to dropped supplies on Borneo and Morotai. Flew Liberator Bombers until the Japanese surrendered . They were then used to transport released Prisoners of War Back Home. Nils returned home from WWII unharmed, but ironically at the age of 26, in early 1951, he had a fatal boating accident near Cronulla. The story goes that he and a mate, Bob Waterford saw a 29 foot whaler cutter with engine, advertised for sale at Gunnamatta Bay. On Saturday, they had planned to go and look at it together, but for some reason Bob didn't make it. Nils purchased the boat on the spot, but made the fatal decision of sailing it around to the Georges River by himself on the very same day. He was warned about heavy seas, but never the less headed out to sea. But instead of sailing north, as planned, was blown by a squall onto the treacherous Jibbon Bomborah, just of the coast of Bundeena. Nils body was never found, wreckage from the cutter was strewn along the coastline. He was only 26 years old. Nils William Isaksen, , son of Nils Morgan Isaksen and Ritta Martha Bottcher.